Glycoflex 2 Bite-Sized Joint Chews for Dogs, 120ct. 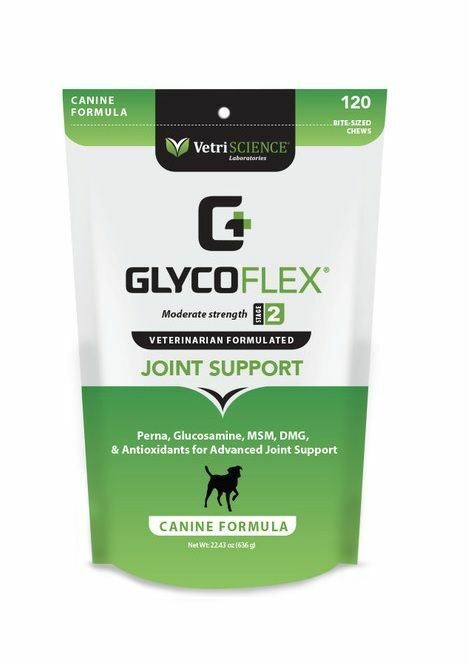 Glyco FLEX 2 Canine Bite-Sized Joint Chews are specially designed for dogs needing moderate joint support. The chews have a delicious chicken liver flavor that your dog will love. They are also recommended for use on adult and maturing dogs as well as sporting and working breeds. 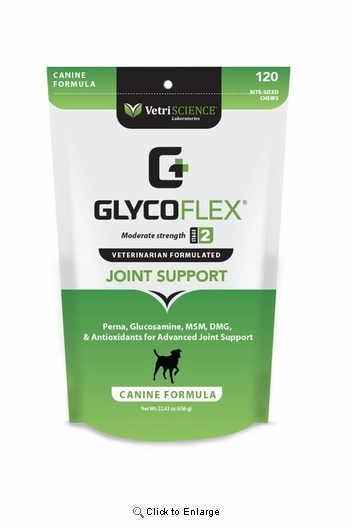 The GlycoFlex 2 formula is veterinarian formulated and features 600 mg of perna canaliculus, 500 mg of MSM, 100mg of our patented DMG (N,N-Dimethylglycine and 750 mg of glucosamine HCI. Inactive Ingredients: Arabic gum, brewers yeast, calcium sulfate, canola oil, chicken liver flavor, citric acid, citrus pectin, glycerin, maltodextrin, mixed tocopherols, oat flour, propionic acid, rosemary extract, rye flour, silicon dioxide, sodium alginate, sorbic acid, soy lecithin, vegetable oil, water.